Are you looking for your dream dog? 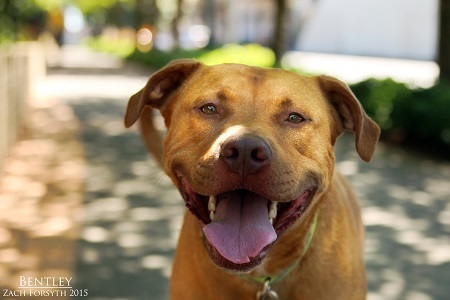 Bentley here, fully loaded with charisma, personality, and of course, a whole lotta love! I am a 3 year old, 50 lb Pit/Lab mix, who is in a superior class. I am confident, even keeled and get a long well with all sorts of dogs and people! Because of my breed I’m best in a home without cats and in an owned home. This luxury canine is great for walking on the street or off roading into nature. I love the couch and I love the beach, you can take me anywhere! When you pick me I promise you won’t take home a lemon! What do you say, want to give this boy a test drive? Fill out an adoption application so we can schedule a meet. I have been fine-tuned by getting fixed, vaccinated, and microchipped. My adoption fee is $250.